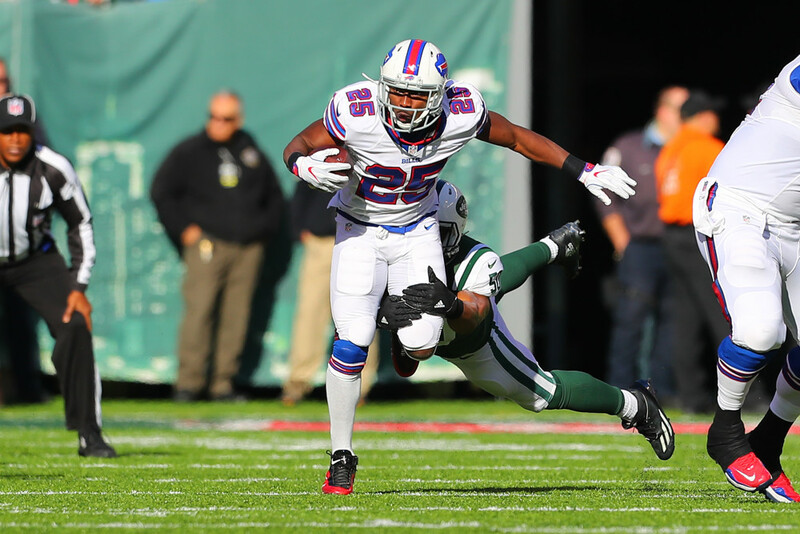 LeSean McCoy is one of the worst consensus top five picks in memory, there due to a lack of competition at RB more than anything else. The problem with McCoy has always been touchdown consistency. He had 14 TDs last year but scored five or fewer times in half of his eight seasons. 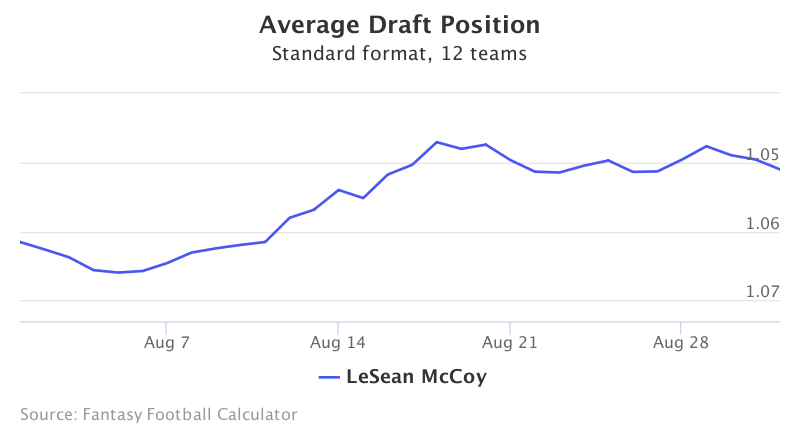 Buffalo traded away stars Sammy Watkins and Ronald Darby for draft picks and appears to be in tank mode, so McCoy will struggle mightily to approach 14 scores again this season. Add that to his age, mileage, and significant injury history and McCoy is all downside and no upside in the top five. 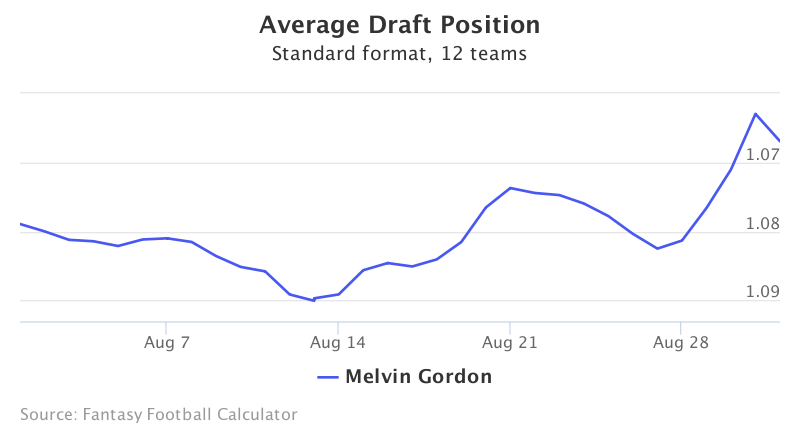 Melvin Gordon went from rookie bust to savior for many teams last season, a late 4th round pick that won many fantasy seasons. This year he’s going among the first ten picks. Gordon had the 4th highest RB points per game and inherits a new offensive-minded coaching staff and some improvements along the offensive line. But there are a lot of warning signs for a player who produced a high volume last season but was never very efficient. Gordon is yet to hit 4.0 yards per carry or 1000 rushing yards for a season, and his value last year depended on his 12 TDs and receiving totals. Gordon had 75 rushing yards only five times and had just two TDs the second half, so the regression has already begun. He’s just too volatile to take in the first round. Zeke was a rookie sensation in 2016 with 1631 yards and 15 TDs, and he looked set to be a top three pick in every fantasy draft this fall. But that was before a six-game suspension sent his ADP spiraling down. But his ADP hasn’t dropped far enough. 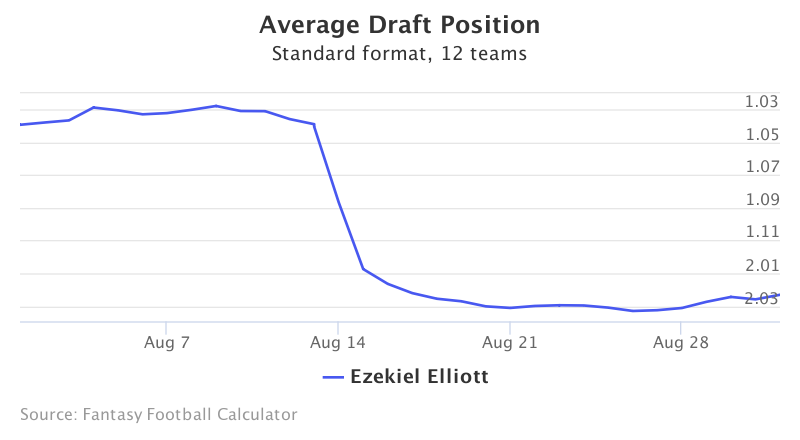 Ezekiel Elliott is still a top 16 pick, a player your team is built around and relying on. If the suspension holds, Elliott will miss six of your thirteen regular season games - almost half of them! Even if he matches last season for the rest of those games, it may not matter. Zeke can become a value if he starts to drop further on draft day, and he may be worth the gamble in the 3rd or 4th round, certainly after. But you need more than one star on your team before you turn this way. Beastmode rode off into the sunset in 2015, but he’s back from retirement now behind a beastly offensive line in Oakland and fantasy owners are rushing to draft him in the 2nd round. Marshawn Lynch hasn’t played in a real game in 22 months, yet he’s being drafted as RB12 which means he’ll be some poor team’s leading runner. Latavius Murray had a fluke season for the Raiders last fall, but Lynch may no longer have the same burst at age 31 and has never been involved in the passing game. 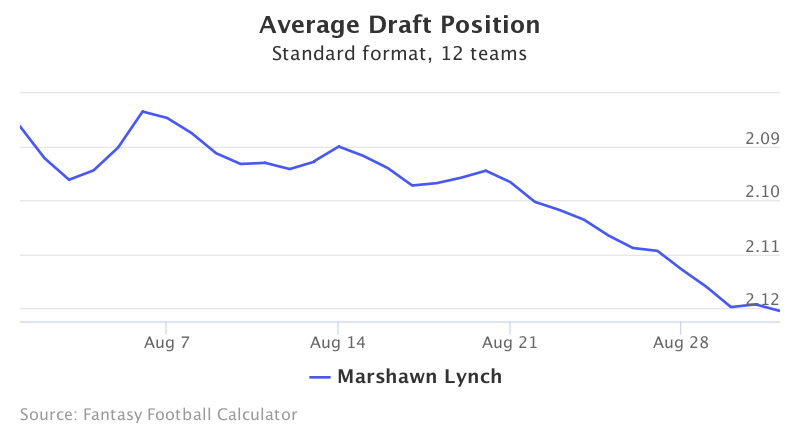 Lynch has to score double digit TDs to come even close to this value, and even then it’s a stretch. He’s also a major injury risk at this point of his career. Stay away early. Fantasy football is a copycat game. Ezekiel Elliott won a lot of leagues last year, and now owners are rushing to find that star rookie this season as Leonard Fournette, Christian McCaffrey, Dalvin Cook, and Joe Mixon are all being taken in the first three rounds. The difference between those four is that Mixon has a lot more competition in his way. Fournette and Cook should be the starter from day one, and McCaffrey does a bit of everything. 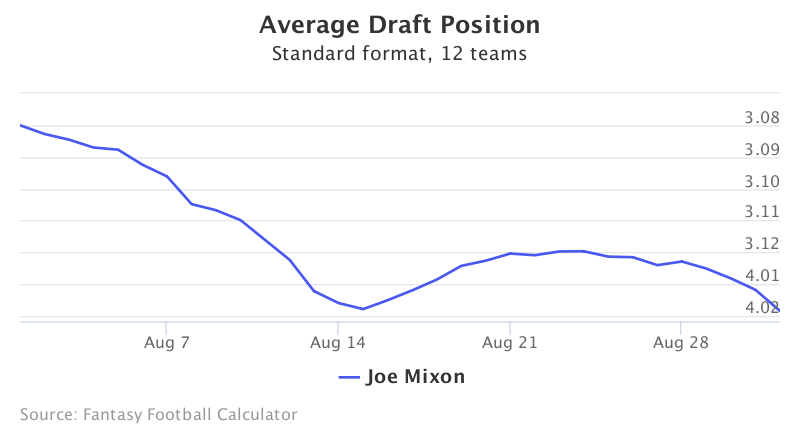 Mixon is talented but begins the season behind both Jeremy Hill and Giovani Bernard. It’s hard to see enough touches for him to be playable early on, and it could take until late in the season or even next year before he gets enough carries to be worth this draft pick. By then your season will already be lost. 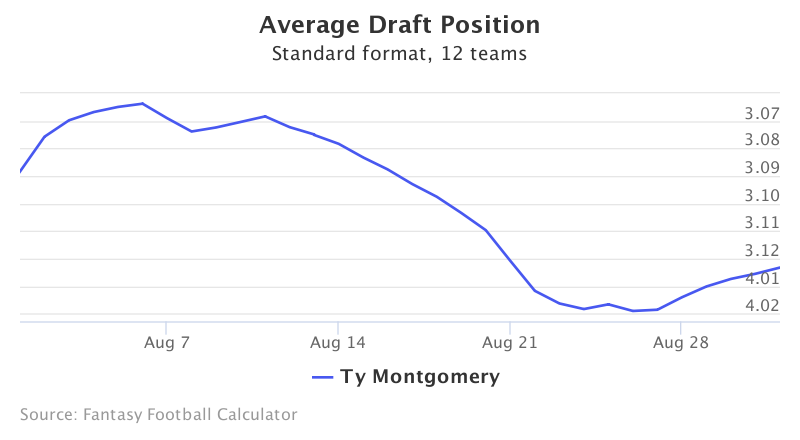 Ty Montgomery was a fun late season pick-up in 2016 that saved many teams, but now he’s getting drafted among the top 40 picks. A converted receiver, Montgomery is anything but a traditional running back and had only one game last season with double digit carries, despite spending half the season as the lead RB. He had 10 receptions in back-to-back games early in the year but averaged just 2.7 catches per game in the second half. Montgomery is a part-time player for an offense that barely runs the ball. He is being way overdrafted by owners desperate for RB help.